Betting on the Super Bowl is becoming more popular every year. There is just something about having action on the big game that makes it that much more interesting, especially considering 30 out of 32 football fans will not be treated to watching their favorite team each year. A big reason that more people are betting on the Super Bowl is how easy it is to place a bet online these days. As an American all you have to do is quickly open a BetOnline.ag account, make a credit card deposit and place your bet. The whole process takes less than 5 minutes and it adds a great deal of excitement. In this article I’m going to break down a quick 3 step guide to placing a Super Bowl bet for Americans who have not yet joined the world of online sports betting. This is the basic 3 step guide to get you some action on the Super Bowl this year. I go over the three steps from setting up an online betting account to finally betting on the big game. The first step is to open an online betting account. As an American you need to find a sportsbook that accepts US bettors and provides easy to use deposit and withdrawal options for Americans. BetOnline is one of the most popular and trusted betting sites serving the United States market. They accept players from everywhere in the USA (and the world), with no state restrictions. BetOnline has customized their sportsbook and payment options to cater towards their American customers. This focus and level of customer service is why they are the top sportsbook online for Americans and the reason I recommend them for your Super Bowl betting. Here’s our full review. 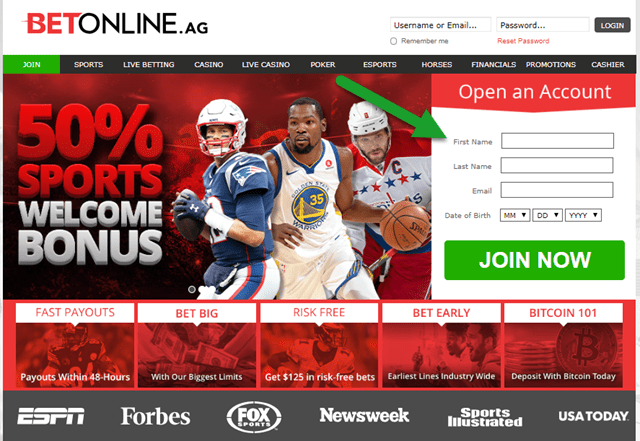 Click here to visit BetOnline.ag and open an account. After clicking that link you will be taken to the following screen. Fill out the short form to open your account. Now that you have your account it’s time to make your first deposit. BetOnline accepts Visa, MasterCard, bitcoin, skrill, Neteller, ecoPayz, entroPay, and a wide variety of other cryptocurrency and e-wallet deposits. If you know how much you want to wager on the big game go ahead and make your deposit. When your bet wins you can cash out via check, bank wire, bitcoin, cryptocurrency, Neteller, Skrill and more. BetOnline offers new depositors a 50% matching bonus up to $1000 on first deposits. Just use promo code BOL1000 when making your first deposit to opt-in. Do you like the Pats -2.5? The Rams straight up? The over on the 57 point total? Now is your time to put your money where your mouth is. Once at the BetOnline website click on ‘Sports’ and then select ‘Football’ -> ‘NFL’.. This will bring up the most common Super Bowl bets at BetOnline. **To bet on the props, open the ‘Game Props’ drop down menu and select ‘Super Bowl’. The number of bets you can place are nearly endless. 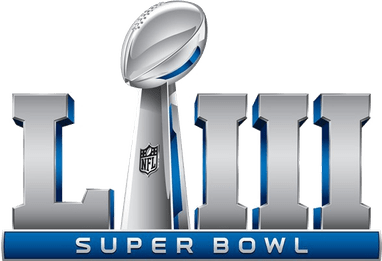 I wrote a quick props article for last years Super Bowl that you can check out to get some ideas and if you’re really new to the gambling world check out our football betting page for some basic information that will help you understand the different bets. That should be it. Follow those 3 steps and you’ll have your Super Bowl bets placed in less than 5 minutes! Good luck! Click here to visit BetOnline.ag.